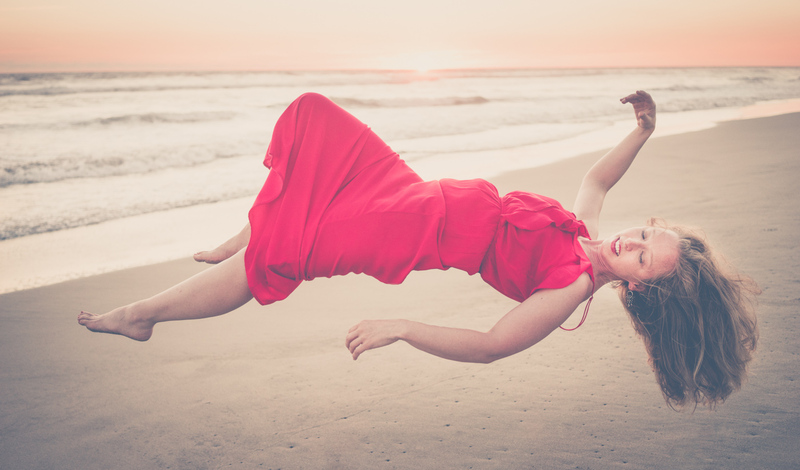 Levitation Photography: Exploring Magic and Portraiture + Free Class Link! It’s been a little quiet on The Photon Collective lately. 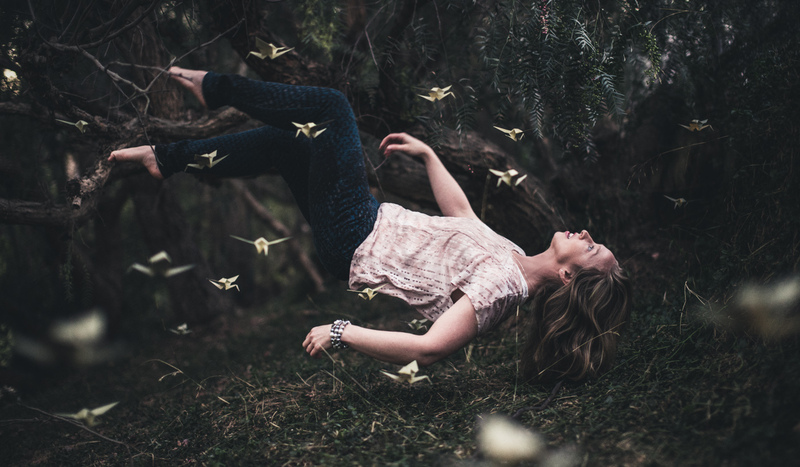 I’ve been working on a new project and online class called Levitation Photography: Exploring Magic and Portraiture. 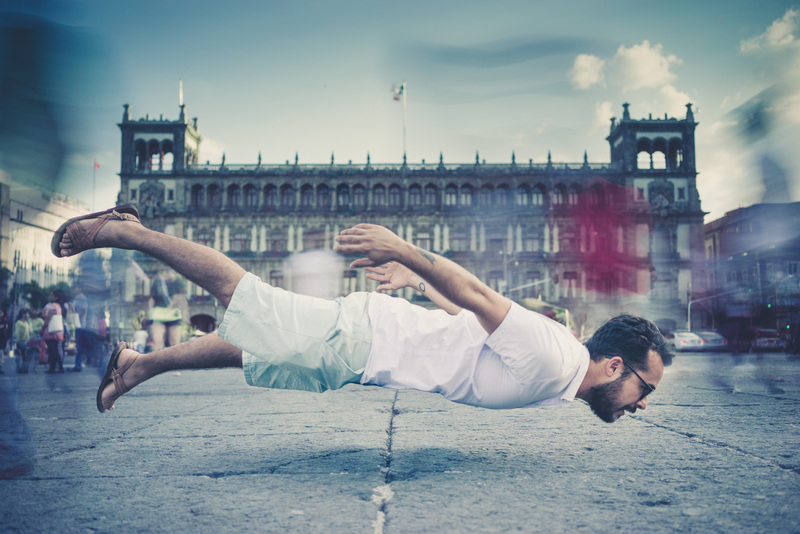 When we launched The Photon Collective, the response to my Levitation Photography Tutorial was overwhelming! 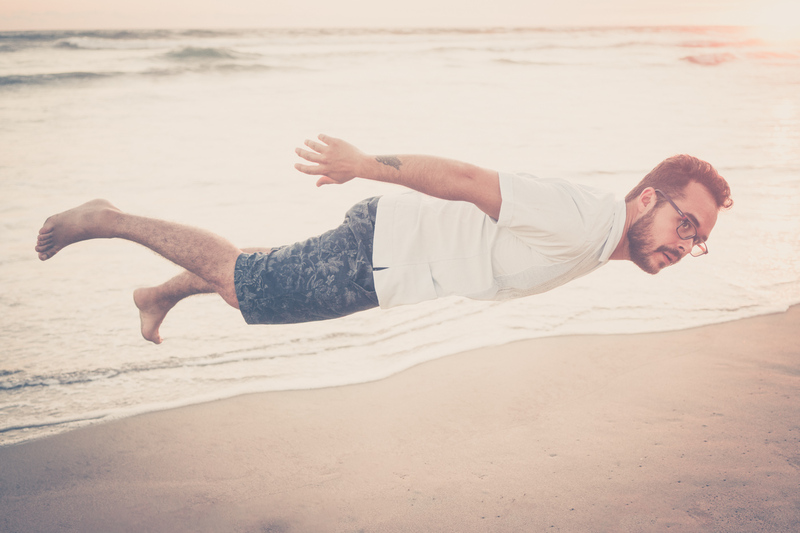 I had a lot of fun with the photos and really enjoyed the processing so I decided that I wanted to make a more in-depth online class that explores everything from planning to equipment, shooting, post processing and especially how to make the large flocks of levitation objects found in my levitation portraits. 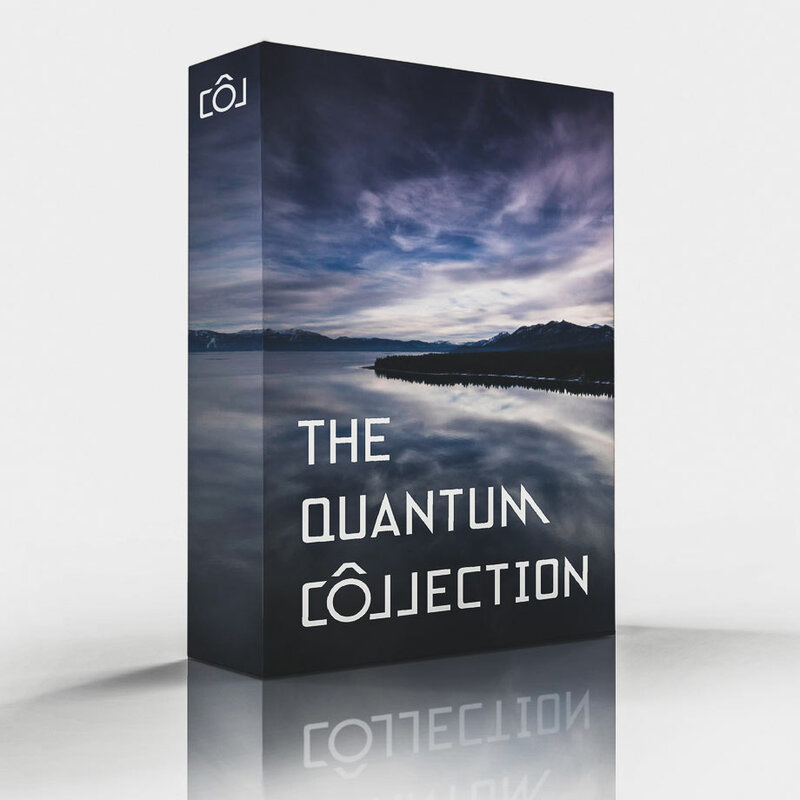 It’s a complete online course that’s free for Photon Collective readers. Read more to learn about the creation of the class. 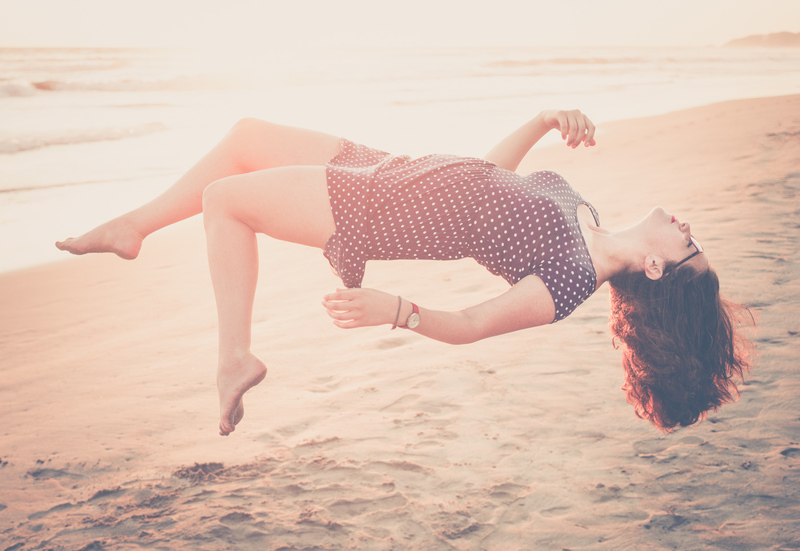 When I made my first set of levitation portraits, the response was overwhelming. Everyone wanted to know how I did it and/or for me to make one of them. You may have already seen my favorite levitation portrait of Diana from my original tutorial. 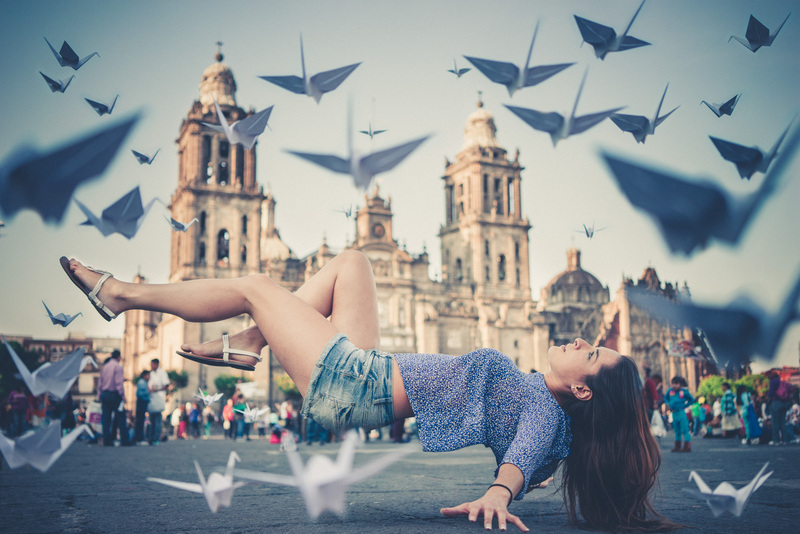 In March, Diana and I arrived in Mexico City with a project in mind: to shoot levitation portraits and to use the content from the project to create an excellent online class to walk anyone through the entire process of levitation photography. 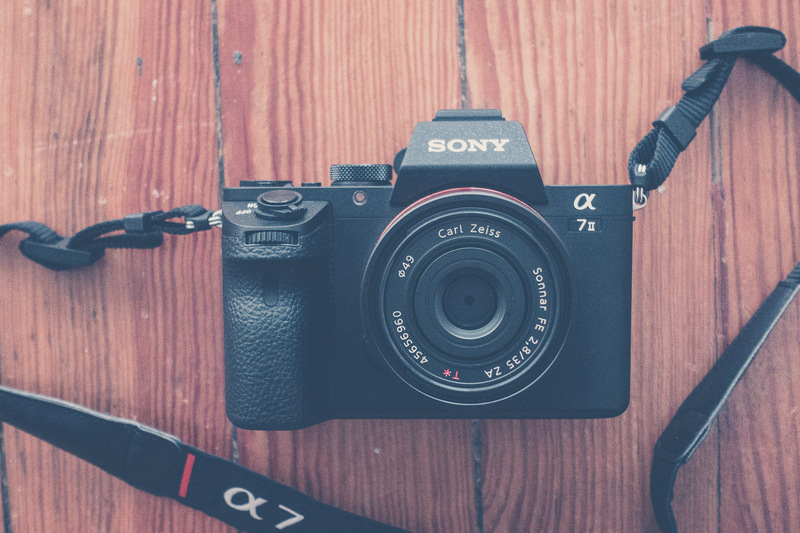 As part of a two month trip abroad, I packed extra light on this trip, completing the entire project on a Sony a7II with the compact Zeiss FE Sonnar T* 35mm/2.8 ZA prime lens, the only camera and lens that I brought with me on the trip aside from Diana’s Sony RX100 III which we used to record video to document the process as content for the online class. My camera setup for all the photos shown in this project. I had a number of different ideas in mind as to how the project would unfold. 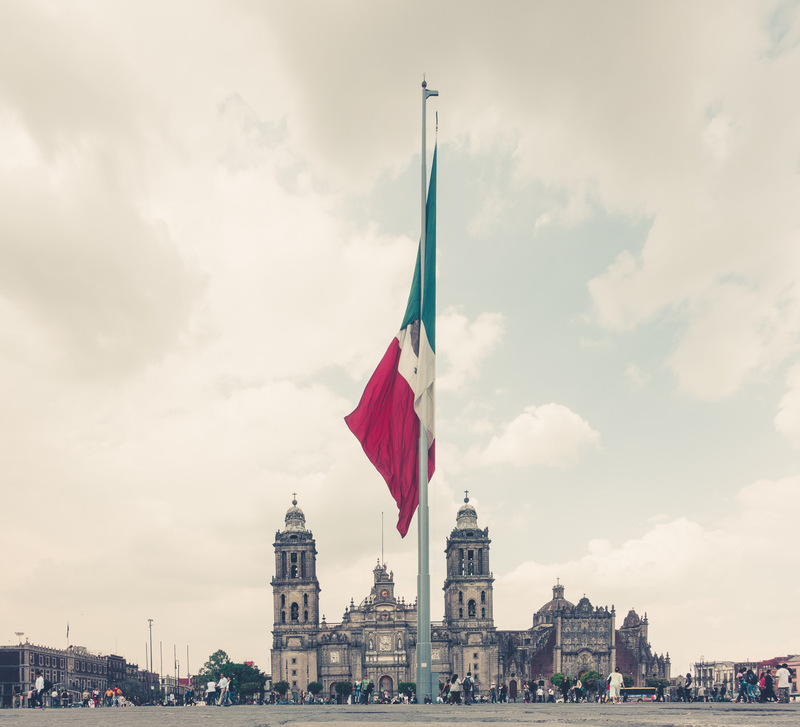 At first I thought that I might just ask a bunch of strangers on the streets of Mexico City as a way to try and find new and interesting people and perhaps to force myself to work on my Spanish. But when we arrived, that idea quickly changed into something else. Diana and I stayed in the neighborhood of El Centro Histórico, the center of Mexico City, just walking distance from La Reforma (the city’s large downtown boulevard) and Zócalo (the central square). In the first week, we were invited by our new housemates, an industrial designer named Rodrigo, and his girlfriend Lu, to share a weekend with them in the beach town of Acapulco. In our travels we try to never turn down an invitation to see or experience something new, so we went. Along the way to Acapulco, we met another new friend, Mónica, and shared our common interests in travel, writing and photography. 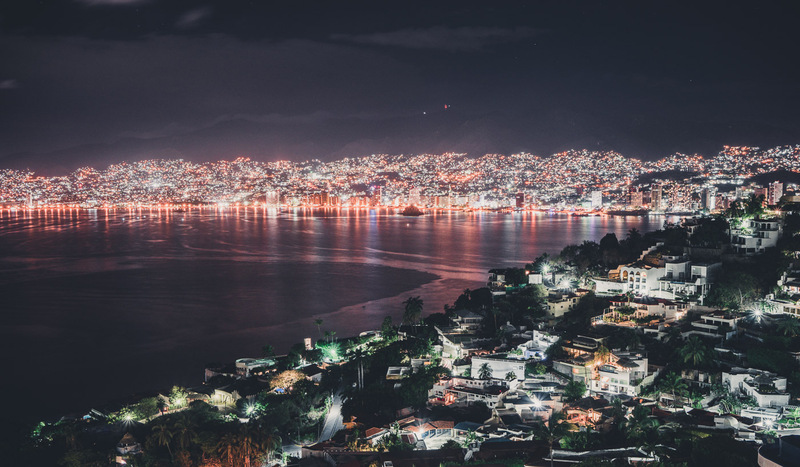 The city of Acapulco, México. After a couple days of eating excellent food (and with a view too), crashing a wedding reception, enjoying time on the beach drinking Clamatos and eating freshly caught fish, we asked all of our new friends if they would allow me to photograph them for my levitation project and online class — and they all agreed. Diana and Lu donned their dresses from the wedding reception and Mónica wore a blue and white dotted summer dress. We were racing to finish shooting before the sun was fully set, so we only had a couple minutes with each person to pull off the shoot before it got too dark. I learned pretty quickly that the most difficult part of levitation photography on a beach is the footprints in the sand. The technique requires separate exposures for the model and the background so the stool can be properly photoshopped out. But when the model enters and exits the scene, it changes the pattern of footprints in the sand, making it difficult to remove the stool in post processing. I figured somehow that it would be easier if we instead shot the photos closer to the water so that footprints would be hidden by the flowing water, but I only found more difficulty as the tripod settled farther into the sand as the waves brushed over its legs. With all the difficulty I was dealing with to keep the frame the same through the shoot, I ended up just shooting handheld, being careful to not move the frame too much between shots. The technique worked but I still would have preferred a stable tripod. Overall, these photographs served as a good start to have some content with the levitation class, but I wasn’t fully satisfied with the results, ultimately wanting something more complex. So on the return trip to Mexico City, I came up with some new concepts that used some of the more complex structure and processing from my very first set of photographs. I envisioned one of two basic concepts that I wanted to explore. The primary concept with the “flock” of levitation objects: an array made from a single object, repeated many times throughout the scene, just like the image of Diana near the top of this post. In a similar technique, I also envisioned another image that combined long exposures instead of levitating objects. I explored both of these concepts the following week by inviting all of our new friends, and a couple even newer friends, to Zócalo, the central square in Mexico City. It just happened to be Easter weekend so the square slowly filled up throughout the day with families and kids flying kites. Our original photoshoot on the beaches of Acapulco was relatively private with only a few people passing by on occasion. We didn’t really get a whole lot of attention. At first I was nervous hosting a shoot like this in such a crowded place but after the first set of photos I realized that most people didn’t even notice the weird group of people shooting photos of the guy laying face-down on a kitchen stool for no apparent reason. As it turned out, having the people roaming around in the background gave the whole shoot a unique feel. We started with Rodrigo who decided that he wanted to position himself on his stomach. After he was too tired to hold his poses any longer, I shot the alternative to the levitating flock: I made several long exposures by adding a 10-stop ND filter to my lens and slowing my shutter to about 1/4 to 1/2 second. I had everyone involved in the shoot walk around in circles in the background of the shot to make the blurry moving figures that you see in the final result. That white figure behind Rodrigo is also Rodrigo! Next up was Leilani. We decided to shoot her portraits in the same location as Rodrigo. Shooting Leilani turned out to be a much faster experience. She’s a professional dancer and it really showed: her movements and positions were all very natural and fluid, just like this was just another dance performance. 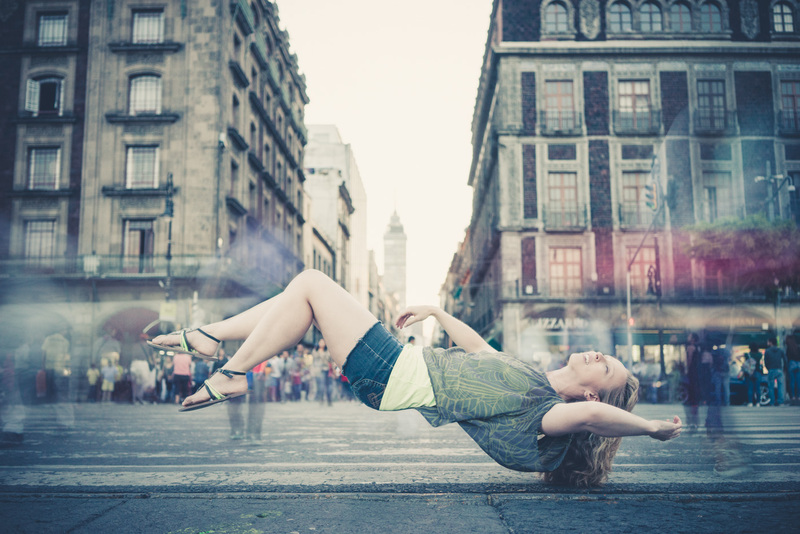 If you know any friends that are dancers, I think they’d probably be a great candidate for a levitation shoot. We were done really quickly with Leilani and right after she was finished we shot a whole bunch of images of a really large paper crane made from an unusually large piece of paper. It turned out to fill the area of the photograph so much more than a “regular” sized paper crane that I chose to include only 7 of probably 100 possible positions in the final photograph. I particularly loved the look of the cranes that were super close to the camera and I’d recommend to not forget to shoot a few shots with your levitating object nice and close to the camera, too. After we finished Leilani’s shots, we turned around 180 degrees to shoot towards the north, in the direction of the Catedral Metropolitana, and started shooting portraits of Lu. Lu is not a professional dancer and it was a very different experience shooting her. She moved her limbs a little bit faster which made it harder to catch her at the right moment, so I took a lot more photos of her just to keep up with her movements. I think, in hindsight, I would have been able to capture more useful photos if I’d asked her to slow down her movements. Mónica’s portrait above is the same one that I featured in the post processing video of the class. I really really love that Monica wore a red dress. It’s not typical to see someone in a red dress and it really makes the image pop. If you plan to shoot a model in a dress, choose red if you can! We then turned eastward and shot towards the Palacio Nacional. I’ve had the concept for the above photo of Andrés in my mind for a long time. 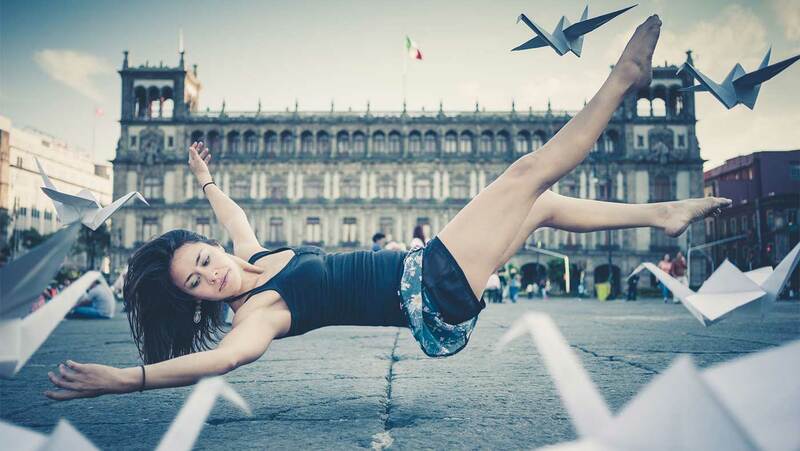 I always wanted to use paper airplanes in a levitation portrait (being the avid paper airplane maker that I was when I was a kid). Some things that came together unexpectedly in this photo: all the blue tones. 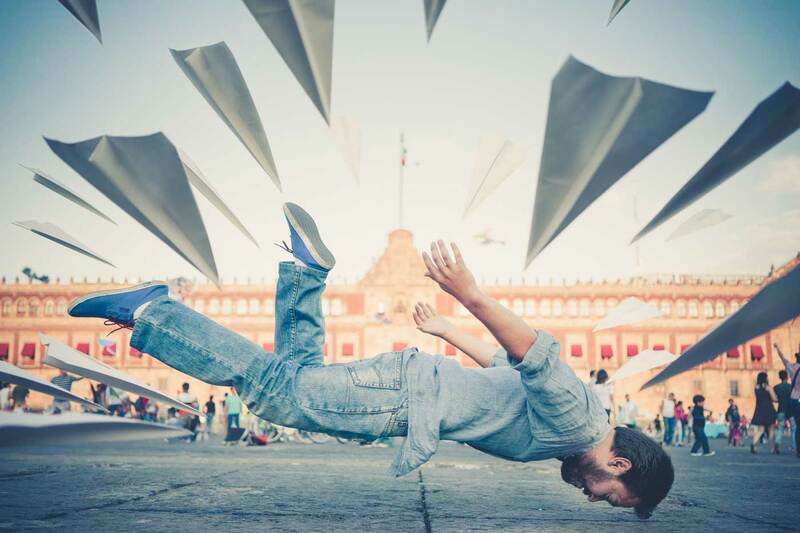 Andrés’s denim, blue shirt and blue shoes along with the blue shadows on the underside of the paper airplanes and the blue tones of the ground all came together to create an interesting result. Finally, as the sun was almost set, we repositioned to face Madero, a busy walking path with a ton of fashionable stores that leads right to Torre Latinoamericano, the tall highrise building visible in the background. For this final shoot, we actually had Mónica positioned in the street and shot her poses during a moment of minimal traffic. After her shots were done I made some more long exposures using the same ND filter as the ones from the first portrait of Rodrigo, this time using shutter times of about 1/2 to 1 second long. I tried my best to capture as much moving traffic as possible. And finally, we finished with a quick photo of Diana. She didn’t plan on being part of the shoot (as she was the one recording all the videos for the class) but we didn’t want to lose the opportunity to snap a quick one of her. Feel free to share this link with all your friends! I’d love to know what you think of the class. Remember that you can shoot me a comment below or join in the discussion section of the class itself. Ian Norman, co-founder and creator of The Photon Collective, is a full time traveler, photographer and entrepreneur. In February 2013, he called it quits on his 9-to-5 to pursue a lifestyle of photography. Follow Ian on Twitter and Instagram. I really admire your work. I only started photography last year and got photoshop when I saw you lavitation shots. I am battling to get the layers to the side In order to erase the front image. How do I do it.